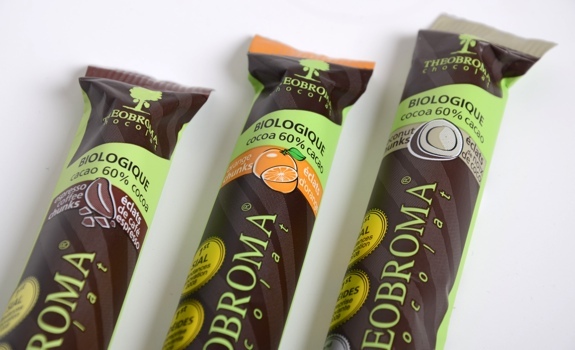 Three varieties of Theobroma Chocolat organic chocolate bars. Chocolate makes me happy, as does organic stuff, so this one-two punch of organic chocolate has plenty of awesome going for it. Here’s my take on three different flavours of Theobroma Chocolat bars. The Pitch: Other than stating the organic (biologique, en français) credentials (with a breakdown of what is and isn’t organic on the ingredients list), there’s not much other info on the packaging. I think they’re hoping people will visit their website for more info, which is too bad, because their website doesn’t have any info about some of these flavours. Ce n’est pas très utile, ça. The Taste (coconut chunks): A nice fruity dark chocolate with chewy coconut flecks mixed in. There’s a slight crunch as you bite into the chocolate as the little pieces of coconut give way. The Taste (espresso coffee chunks): Same dark chocolate, but with crunchy little pieces of crushed coffee beans thrown in. The chocolate is bright and sweet, and the taste/texture is not unlike eating chocolate-covered espresso beans. Expect the little bits of coffee to get stuck in your cheeks. The coffee tastes stale, but ground coffee in a chocolate bar isn’t going to taste its freshest, is it? 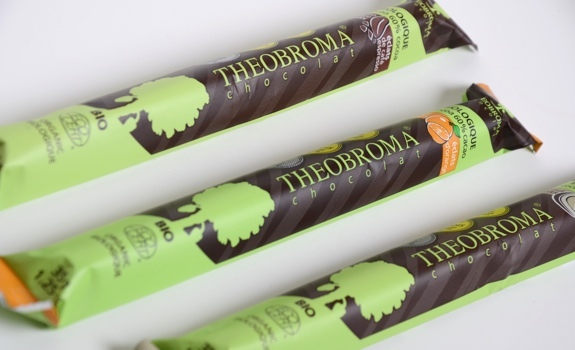 Theobroma Chocolat organic chocolate bars, in their nifty green and brown wrappers. Pretty! Cost: $2.99 per bar at DeLaurenti Food & Wine at Pike Place Market, Seattle, U.S.A. Gifted to NEAROF! Value for cash money: OK. More than a standard chocolate bar, but you’d expect that with organic anything. Availability: These were purchased in the States, but they’re much more widely available in Canada. In Edmonton, you’ll find them in the chocolate section at Planet Organic. Nutrition? : The packaging is lovely, but there’s no nutritional info on it. Stupid, stupid, stupid. You have to go searching around on their website for nutritional info, but the packaging/portion size doesn’t seem right, and a couple of these bars don’t appear to exist. Frustrating. Made in Canada, eh? : You betcha. They’re made in Québec City. The verdict: Of the three flavours, I like the orange most. They’re all good, but not spectacular. For best results, adjust your expectations, and know that anything lost in taste is made up for in eco goodness. I may buy them again to scratch an itch, but I won’t line up overnight at Planet Organic to buy more. Shades of Toblerone, I'd say. But these are all organic-like. I just saw the raspberry one at Planet Organic last week, so I’ll have to give it a try. Raspberry and chocolate are such a great flavour combo. The coconut bar makes me stand up and take note! I’m going to check out our organic store (Nature’s Fair) and see if they carry these and in what flavours. It sounds like it could be a nice treat. It doesn’t sound spectacular, but anything organic is worth a try! (at least once) Plus it’s CANADIAN! (bonus) How can you go wrong? I just picked one up at Save on foods. 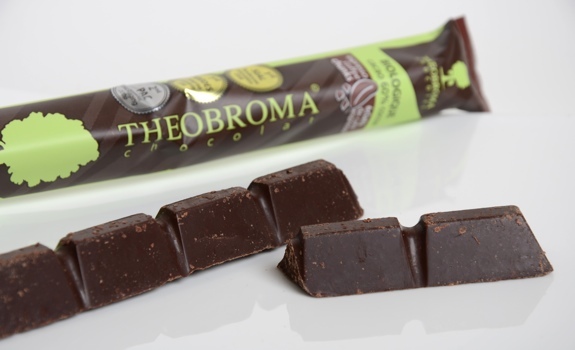 After you mentioned it, I noticed a small selection of Theobroma chocolate bars at a Save-On in Edmonton, too. Thanks for the tip!